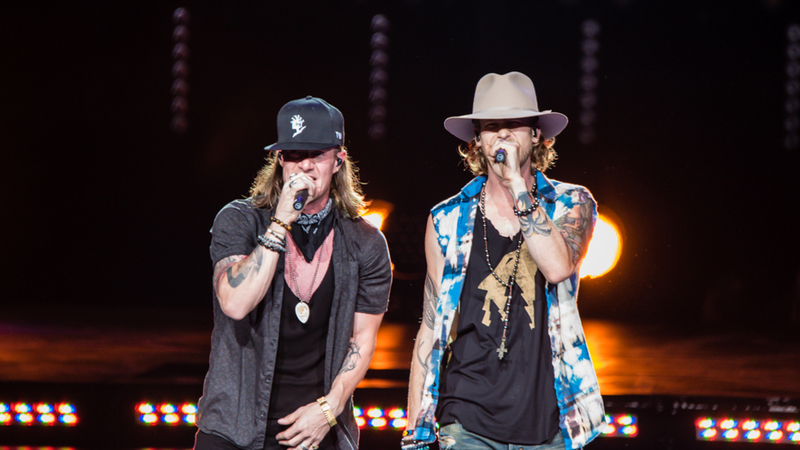 Tyler Hubbard and Brian Kelley of Florida Georgia Line first stole our hearts back in December of 2012 with the release of their debut album, Here’s to the Good Times. The record showed off their incredibly innovative style and showcased their unique fusion of country, hip-hop, rock, and pop. A couple months later, more fans started supporting the duo after hearing their first single, “Cruise”, which featured hip-hop artist, Nelly. Fast-forward four years, and the pair are on their third album, Dig Your Roots, which includes collaborations from legends, Ziggy Marley, son of reggae legend Bob Marley, fellow country star Tim McGraw, and even the Backstreet Boys. It’s not surprising then, that on September 17 they sold out the Hollywood Casino Amphitheater in Tinley Park, IL, which holds 30,000 people. The pair put on one heck of a show for their fans, as they jumped around onstage sporting snapbacks and cowboy hats—making for a night that they'd never forget. That was borderline insane @flagaline tonight in Chicago! I say we should go bigger next time! @thubbmusic @playbkplay what say you? With a Florida Georgia Line concert, it’s usually a “you’d have to be there” moment, but luckily we were there to capture it all. Check out our gallery from the show below, and make sure to follow the group on Bandsintown so you never miss them live.